According to 41pounds.org, the average adult receives a whopping 41 pounds of junk mail each year (that’s about 560 pieces!) and most of it goes unopened. Reducing junk mail (and some regular mail too) will save you time, prevent paper clutter AND reduce your carbon footprint! How great is that? So how exactly do you stop the onslaught of junk mail, glossy catalogs and pre-approved credit card offers? Below is a list of 5 ways to eliminate unwanted mail from your mailbox. Junk Mail – sign up for the National Do Not Mail List at www.directmail.com. Simply fill out the form and indicate your preferences. It may take up to 3 months to take full effect because some direct marketers pre-print labels way in advance but this one, simple action can significantly reduce your junk mail. Bills – Although we can’t stop bills from coming in, you can stop paper bills from coming in the mail. Simply go on to the websites of your utility companies and other companies you regularly receive bills from and opt for e-billing. You can also opt for email notifications when your bank and investment account statements are available rather than getting the paper statement. All you need to do is go to your bank’s website and opt for e-notifications or e-statements! Catalogs – There are two great ways to take your name off of catalog lists. The first one is to sign up at www.catalogchoice.org. The second is www.PaperKarma.com. PaperKarma.com is a free app for both iPhone and Android that allows you take a photo of the mailing label on the catalog and voila! they will contact the company and remove your name from the list. Couldn’t be easier! Pre-Screened Credit Card and Insurance Offers – To opt out go to www.optoutprescreen.com. You can opt out for five years or permanently but you’ll need to complete the opt-out process for each adult member of your family. You can also call toll-free 1-888-5-OPT-OUT (1-888-567-8688). Opting out of these offers will also reduce your chances of identify theft! Mail Addressed to Previous Tenants – If you’ve recently moved to a new place, you might find yourself inundated with the previous tenant’s mail. The first thing to do is speak to your mail carrier or leave a note for him/her. You can also simply cross out the address with a sharpie and write the words “Moved” or “No Longer at this Address” on the envelope. Add “Return to Sender” and drop it in the mail. The company will (hopefully) update their records. If you prefer to delegate this task, contact www.41pounds.org and they will take care of it for you! They will contact 20-35 direct marketing and catalog companies based on the information you provide. This includes almost all credit card offers, coupon mailers, sweepstakes entries, magazine offers and insurance promotions, as well as any catalogs you specify. 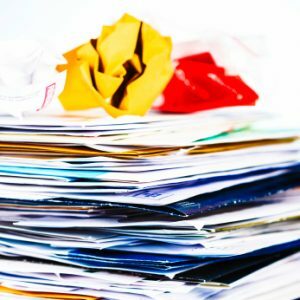 So there you have it, 5 ways to reduce junk mail (and some regular mail too:), prevent paper clutter AND reduce your carbon footprint! Have you used the methods above to reduce junk mail? Leave a comment below and let us know the results!